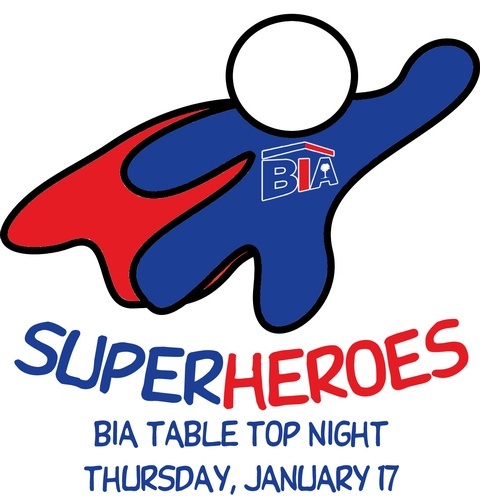 BIA Table Top Night is a great way to start the New Year. Members can sign up to exhibit their goods and services during the event. All other members are invited to attend the event, visit the exhibits, and enjoy food and drinks in this fun atmosphere. This year's theme: BIA Superheroes! Exhibitors and attendees are encouraged to dress as their favorite superheroes from TV, movies, comic books or just make up your own... all of our members are SUPERHEROES!! $125/table top - Best Decoration/Costume Display will win their registration fee back. $25 for Guests with pre-registration or late/no registration members.